Pacific City and the Nestucca Valley on the Oregon Coast are a short hour and a half drive from Portland or a little over an hour from Salem. They are located 25 miles south of Tillamook and 20 miles north of Lincoln City off US Highway 101 at scenic Cape Kiwanda, on the Three Capes Scenic Loop. Here you will find Shorepine Village and beautiful beaches in the shadow of Cape Kiwanda and capped by the southern Haystack Rock just off shore. You might catch a fishing dory on the beach, a beautiful sunset glimmering between the Rock and Cape, or a wild Pacific storm churning onto the beach. 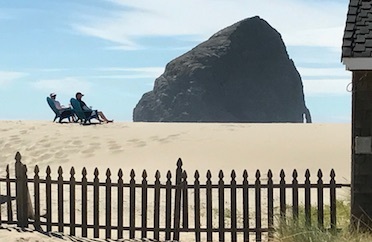 Picture above of Haystack Rock in Pacific City, Oregon. Copyright PacificCity.Net - All rights reserved. Go here to get a Pacific City email address.